Saddlebag design for easy use. Holds up to 20b lbs of sand. The sandbags are made of heavy duty construction. And they are durable for adding weight. Dual interior compartments with double zippers for each compartment.Can be filled with anything; sand, gravel, even nuts and bolts. 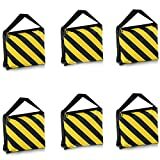 With black and yellow color design, it distinguishes these sandbags from other normal sandbags.Used to stabilize truss totems, bases, tripod stands and/or lighting equipment. Note:the sandbags are empty.The tripod is not included. Dual interior compartments with double zippers for each compartment. Can be filled with anything; sand, gravel, even nuts and bolts. With black and yellow color design, it distinguishes these sandbags from other normal sandbags. Used to stabilize truss totems, bases, tripod stands and/or lighting equipment. Useful with boom arms, light stands, tripod, etc. This entry was posted in Discount Photography and tagged Arms, Black/Yellow, Boom, Dual, Film, Handle, Light, Neewer, Pack, Photography, Saddlebag, Sandbag, Stage, Stands, Studio, tripods, Video by Ball Photo. Bookmark the permalink.